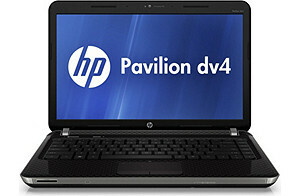 HP Pavilion dv4-4140us comes with 2.2 GHz Intel Core i3-2330M dual-core processor, 4 GB DDR3 memory, 640 GB (5400 RPM) Hard Drive with HP ProtectSmart Hard Drive Protection, SuperMulti DVD burner, 14-inch HP BrightView LED backlit display, and Intel HD Graphics 3000 with up to 1696MB total graphics memory. The memory is upgradeable up to 8 GB. Other specs include 6-cell 55WHr Lithium-Ion battery, Dolby Home Theater with Altec Lansing Speakers, three Universal Serial Bus 2.0, HDMI, VGA (15-pin), RJ -45 (LAN), Headphone-out, Microphone-in, and Digital Media Card Reader for SD and MMC. Height : 1.22 - 1.40"